with the detail, fit and finish found amongst only the finest of instruments. 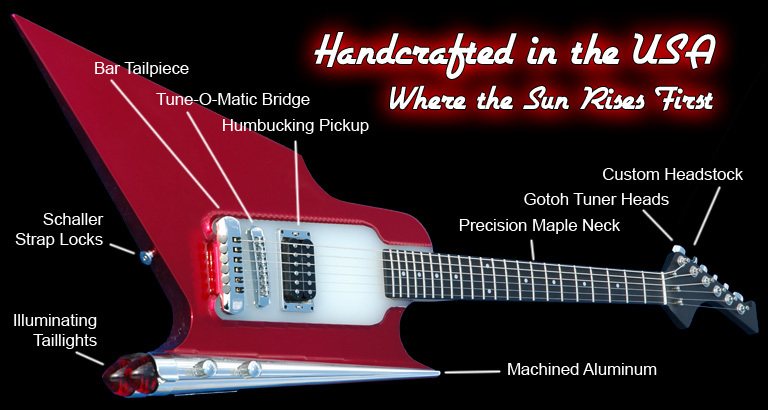 These guitars are hand crafted, one of a kind instruments with extraordinary special features. The body and tail lights illuminate at your control. Flex the tail fin and it acts like a pitch bender. The body is made of a special composite plastic giving it a ton of sustain, great for rockin' and sounds great clean too. With precision maple necks and our custom trademark headstock - qualitiy at is best ! Be sure to check out our in house virtuoso guitar great, Ronny Lako in our artist's section to see and hear our axe. These above components are standard in our "58" guitar design. We can custom build your "58" with substitute and/or upgraded components at your request. Cost may vary depending on the options you choose. Remember each "58" is hand built just for you. The "58" is the first of many designs to roll out of the garage at East Coast Guitars. Have a listen to the demo performed by Ronny Lako. 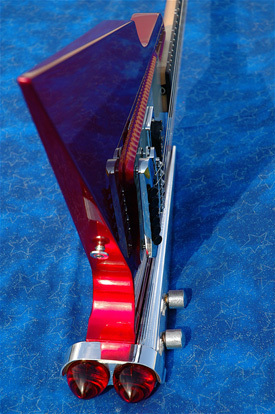 Pictured here is custom color "Rachel Red". Definitely not your Grandpa's guitar ! 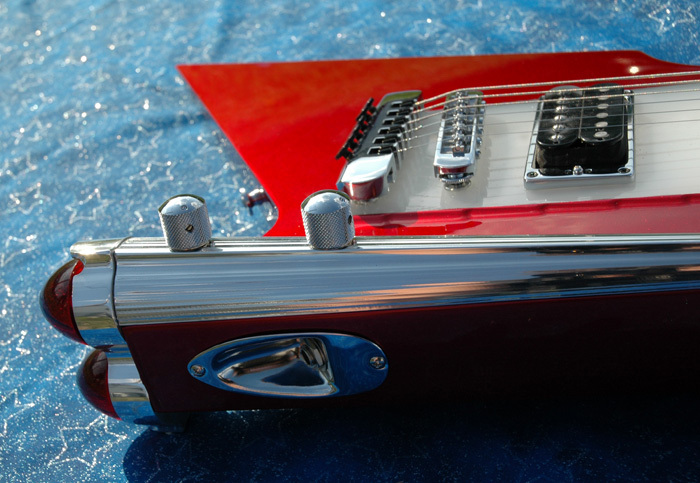 Our Guitars are priced to order based on components, configuration, body style and finish. THERE ARE 10 -”58’s” AVAILABLE OF OUR FIRST AUTOGRAPHED SERIES. When purchased we will deliver the guitar to your doorstep and film you accepting your new 58 for our web site and TV pilot that we are producing. EACH GUITAR IS BUILT TO ORDER WITH A DELIVERY TIME OF APPROX. 30 DAYS PLUS SHIPPING AFTER YOUR ORDER IS PLACED. I’M PROUD TO PRESENT THE “58” TO YOU AT THIS TIME. A LOT OF HARD WORK FROM ARTISTS AND CREATORS THAT ARE FROM THE TRI-STATE AREA AND I HOPE YOU WILL GET A CHANCE TO ENJOY OUR GUITAR AND OTHER E,C.G. PRODUCTS BE A PART OF OUR COMPANY HISTORY I KNOW YOU WILL BE SATISFIED. THANK YOU, BEN LATTANZIO E.C.G.